The best ocular examination you’ve ever received. 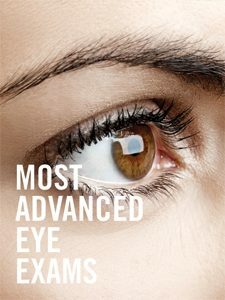 At Ocean Eye, we pride ourselves in providing our patients with the highest quality products and services. That mission starts with an extremely thorough yet efficient eye exam. Our eye exams ensure that your visual system is functioning at the highest level possible. The first part of an eye exam includes a discussion of your medical and ocular history, as well as pertinent family history. We then perform a computerized glasses prescription (auto-refraction), keratometry readings (corneal curvature to evaluate for astigmatism), visual assessment for distance and reading (20/20, etc. ), pupil reactions, ocular motility (ability of your eyes to move in conjunction), ocular alignment (evaluates for strabismus, also known as ‘lazy eye’), peripheral vision testing, depth perception, intra-ocular pressures (evaluation for glaucoma) and color vision evaluation. Once this testing is performed by our highly knowledgeable staff, your eye doctor will then evaluate the health of your eyes using a specialized microscope called a slit lamp. Your doctor will then review the Optos Images (non-dilated retinal imaging) that were obtained earlier to evaluate the internal health of your eyes to check for glaucoma, cataracts, diabetes, high blood pressure, macular degeneration, retinal holes/tears, retinal detachments, ocular cancers/tumors, among other ocular conditions. In some cases, your doctor may choose to dilate instead of reviewing the optos images based on family history, risk factors or findings on the Optos images that may necessitate further evaluation. Our eye exams also evaluate for the presence of dry eyes and ocular allergies, 2 of the biggest contributors of ocular irritation in our region of the United States. On the forefront of technology. Our practice uses some of the best technology available in ocular healthcare today. Our electronic medical records network allows us to provide a higher level of service to our patients and creates a much more efficient exam process. The technology also reduces our paper usage, making our office more eco-friendly. Optomap® Retinal Exam. In our effort to continue providing our patients with exceptional service, we have instituted Optomap Retinal Technology into our practice. We now perform OptoMap Retinal Imaging on ALL patients at their annual eye exam. The Optomap provides a 200°image of the retina, compared to just 45°with most retinal cameras. It serves to replace or compliment dilation, depending on the overall health of your retina, however most patients will not need to be dilated following OptoMap Imaging. This technology is able to detect changes in the retina due to diabetes or high blood pressure, macular degeneration, glaucoma, retinal tears/detachments and ocular cancers, among others. Your doctor will review the results of these images with you at the conclusion of your exam so that you understand the health of your eyes and what conditions we are looking for. Optomap Retinal Exam is a non-covered benefit for our patients and our office charges $32.00 per patient for this technology. For more information on the Optomap Retinal Exam, click here.